Let no one doubt New Jersey Gov. Chris Christie again. He went offscript last weekend, predicting that the narrative of the race would change Thursday morning. And lo and behold, he was right. At least for a little while, the chattering class will put a pause on all the talk about how Mitt Romney is falling behind in the polls to talk about how he managed to beat President Obama at the podium. 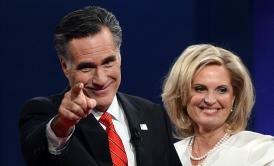 Romney went on the offensive, forcing the president, who looked none too happy to even be there, to defend his policies. And perhaps most perplexing of all, Obama failed to mention the infamous 47-percent remark and Bain Capital, two issues that his campaign has been hammering home for months. Let’s take a look at some commentary. Obama, like other presidents before him, “fell victim … to high expectations, a short fuse, and a hungry challenger,” writes the National Journal’s Ron Fournier. “Romney smiled and cracked jokes … Obama smirked.” It seems commentators didn’t need to watch until the end to come to that conclusion. Buzzfeed’s Ben Smith called the debate for Romney some 40 minutes in, saying the Republican’s “core success was that he won by not losing.” In Time’s Mark Halperin’s report card, it wasn’t even close. Romney got an A-, while Obama received a B-. There were “no haymaker punches thrown and not much in the way of one-line zingers,” write Steve Holland and John Witesides at Reuters. “Romney, however, may have done himself some favors with crisper answers than Obama, who sounded professorial and a bit long-winded.” What’s undoubtedly frustrating for Democrats is that this was exactly the thing many had warned the president about before the debate. Also in Slate, David Weigel reports from the spin rooms and John Dickerson asks whether Romney can make his newfound momentum last longer than a day.